Find more coins at attractive prices and enjoy the Künker quality you are accustomed to in our ebay shop. Please learn more about the consignment of your items to a Künker auction, direct purchase and how to make the best of your coin values. Value trade and simple handling are our business. Trying to figure out the value of your coins or whether you possess a rare exemplar? Please learn more here. six exciting and successful auction days came to an end on Friday, October 12th, 2018 at 5 pm with the last hammer in Osnabrück, Germany. Before we present to you some extraordinary hammer prices in detail, we first want to take this opportunity at the end of this eventful week and begin by thanking you! On the one hand you, our bidders and collectors, who were present again numerous in Osnabrück, on the telephones and with your written bids. You, our dear bidders, provided once again for a series of extraordinary hammer prices. On the other hand we thank our consignors, who have entrusted us with their pieces and collections, and made this auction possible in the first place. 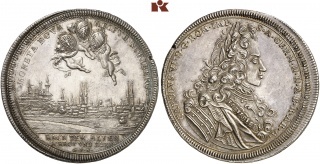 Starting with the orders and decorations last Friday up to the Russian coins and medals on today's Friday afternoon, a total of 8038 lot numbers were auctioned off here in Osnabrück. Overall the 8038 objects were estimated at 7.1 million euros. After the last piece was sold, we can proudly and also humbled present the extraordinary total hammer price of EUR 11.3 million euros (NOT including buyer’s premium).If you look at the five auction catalogues, you will quickly discover that in this year's autumn sale we were once again pleased to be able to offer a multitude of entire collections, that were put together over the course of many years. Starting with the decorations from the Groch Collection, from the collections of Saxony, Mecklenburg and Cologne to the special collections of Electron-coins and Bavarian gold coins - as different as the offered collection areas might have been - there were a multitude of interested bidders present here in Osnabrück for all of them. Some of the most outstanding hammer prices can be found below.We would like to thank you once again for your interest and trust in us! We are pleased to welcome you again on 31st of January 2019 to our Berlin auction sale, which will be held as always on the Thursday before the World Money Fair.